New Neapolitan M&M's can now be found exclusively at Target as an Easter-themed flavor (maybe because of the pastel colors?). The limited-time flavor features "chocolate, vanilla, and strawberry flavors in every piece." The candies are triple-layered with a candy creme center, a milk chocolate outer layer, and a brown, cream, or pink-colored candy shell. 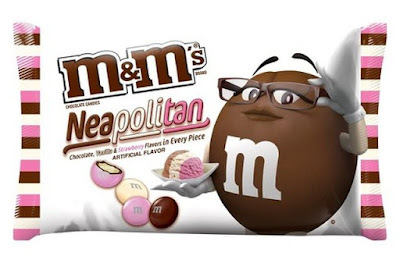 Neapolitan M&M's come in 8-oz bags and are currently on sale for $3 on the Target website (regularly $3.19). Sticking with the Easter-Neapolitan theme, Target is also offering Neapolitan Peep's Delights in three-count 1.5-oz packages for $2.09.